As artists, Jeremy Mann and Joseph Todorovitch figurative artist Todorovitch has been challenging are constantly finding new ways to challenge their himself by working more intuitively. “I’m trying to artistic processes; to push their paint application and mark making to new limits, allowing for exploration in each composition. This goes beyond the subjects they paint and speaks directly to their techniques. March 12 to April 2, the artists will exhibit in a two- man show at Maxwell Alexander Gallery in Culver City, California. On display will be brand-new works that highlight their signature subjects as well as show artistic evolutions. 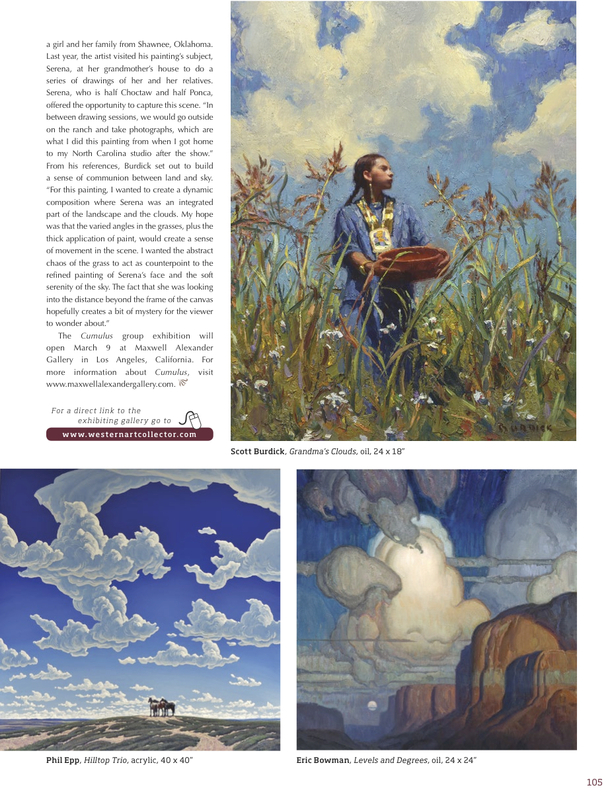 The 10 participating artists include Logan Maxwell Hagege, Mark Maggiori, and Scott Burdick. 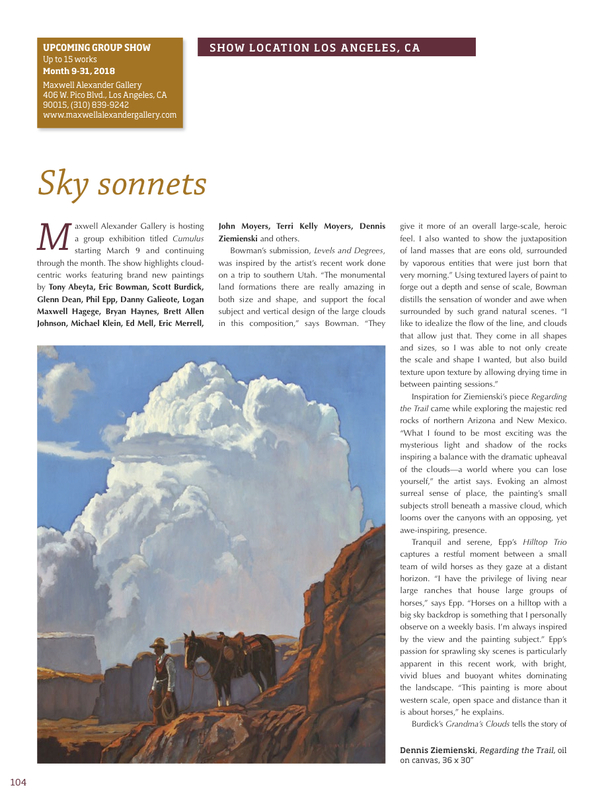 The exhibition will feature about 15 works, ranging from the dramatic cloud-filled oil on linen Dark Clouds, Monument Valley, by G. Russell Case; to the exaggerated shapes found in Tracy Felix’s abstract-tinged oil on panel Valley Towers; to Billy Schenck’s oil on canvas Coming from the Bisti and Glenn Dean’s oil Navajo Moonrise, featuring Navajo figures on horseback. 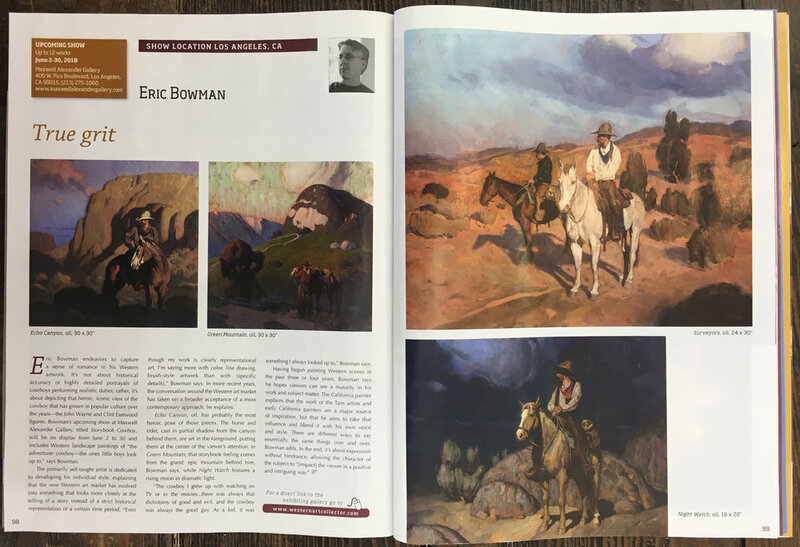 This story was featured in the October 2015 issue of Southwest Art magazine. A cowboy leaning against a fence at the end of a long day could easily be an image from painter Mark Maggiori’s repertoire, but the scene also describes the artist himself. 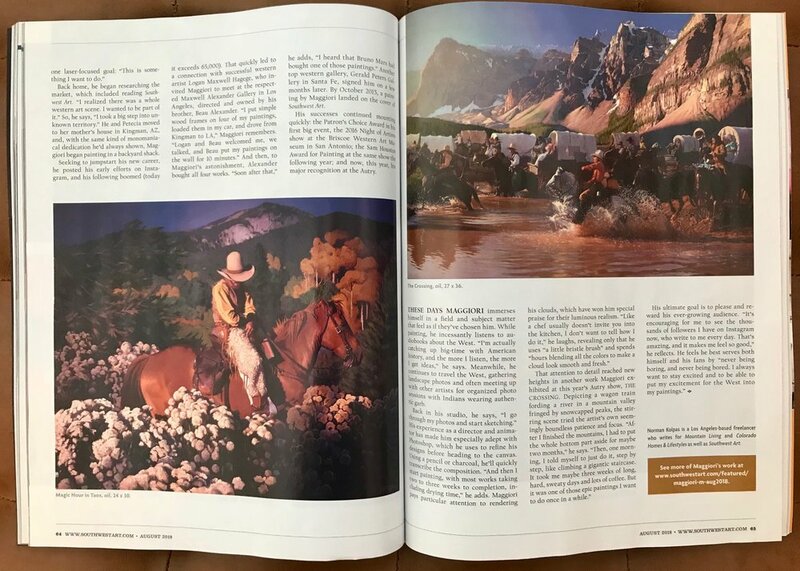 The Frenchman-turned-American has immersed himself in the culture that first captured his imagination as a teenager, donning the look by dressing in vintage cowboy wear and adopting the lifestyle by spending weeks on the range in Arizona and Utah. It’s all in service of creating the paintings in his first-ever solo show at Maxwell Alexander Gallery this month. The show opens with an artist’s reception on Saturday, October 10, from 7 to 9:30 p.m.
Maggiori first traveled the American West when he was 15; Monument Valley and Canyon de Chelly left an indelible impression on him, and he vowed to return. The multifaceted artist went on to graduate from the prestigious Academie Julian, in Paris, and then traveled the globe with a rock band, eventually migrating to Arizona with his wife. 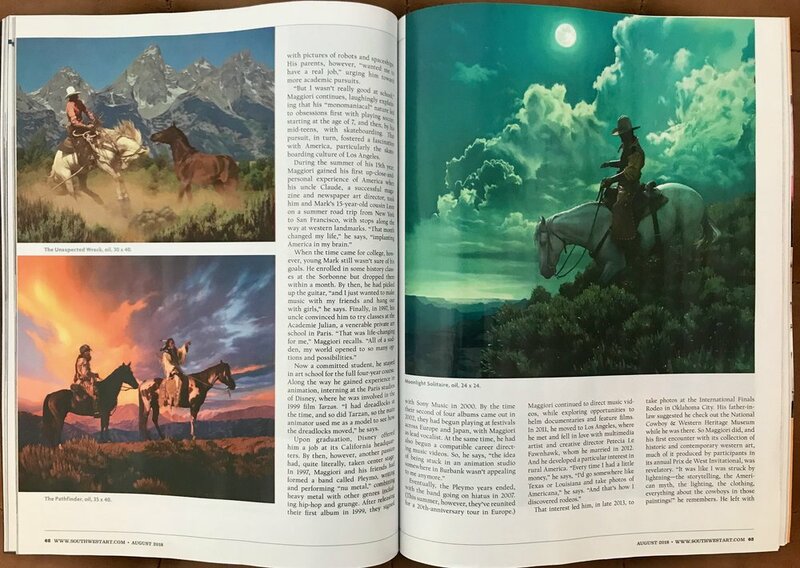 For the past two years he’s devoted himself to painting full time and has chosen cowboys, the iconic figures of the American West, as his exclusive subjects. Artist Logan Maxwell Hagege first discovered Maggiori’s work, recommending him to Maxwell Alexander Gallery, which became the first to show the Frenchman’s work. The gallery has been instrumental in guiding his career during the lead-up to this solo debut. “Over the past year and a half, he’s really developed his style and technique. He’s ready for it,” says gallery owner Beau Alexander. 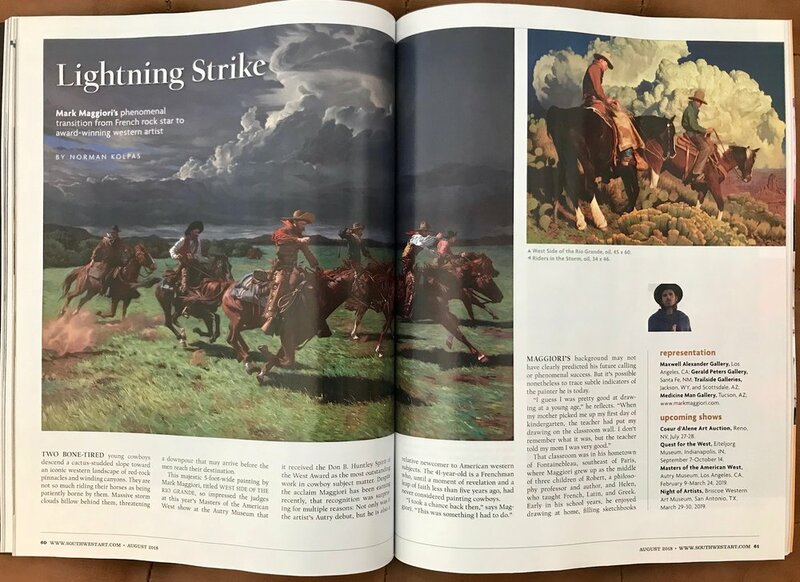 “Maggiori is bringing a breath of fresh air into western art.” Alexander cites Frank Tenney Johnson and Frederic Remington as two of the artist’s influences, yet observes that Maggiori’s work feels wholly contemporary. Drawing upon his background as an illustrator, photographer, and music-video director, he arrives at a unique vision that feels alive. He renders cowboys and horses realistically, while his loose brushwork pulls the backgrounds into impressionism. “Cowboys are a very strong image of freedom. They represent a time when everything was possible here,” Maggiori says. His view of cowboys today, however, is grounded equally in romanticism and reality. Currently based in Los Angeles, the artist does studies on location and spends weeks with his favored subjects. “It’s amazing to see cowboys actually leading this life,” he adds.